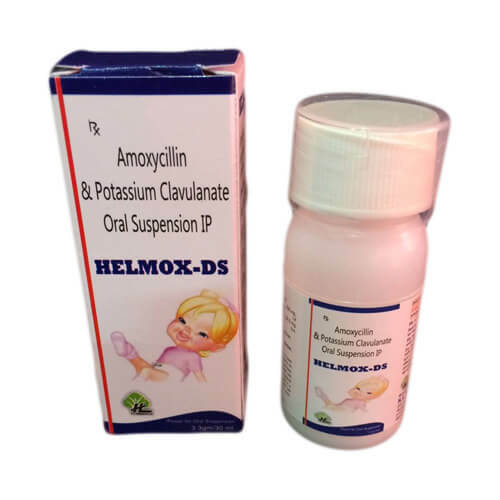 HELMOX-DS | Amoxycillin 200mg+Potassium Clavulanate Acid 28.50mg – The combination of these compounds are useful for treating the variety of bacterial infections such as sinusitis, pneumonia, ear infections, bronchitis, urinary tract infections, and skin infection. It helps by inhibiting the growth of bacteria. It reduces the development of bacteria and maintains the effectiveness of amoxicillin and clavulanate potassium in the body. Clavulanate potassium helps to inhibit certain bacteria from becoming resistant to amoxicillin. You should not consume this medication if you are suffering from kidney disease. In case of liver problem, jaundice or if you are allergic to it. Always consult your doctors before consuming it. Make sure that it would not provide you any side effects.